Exceptionally large dust devil in Kansas known as a land spout. Credit: Jim Reed. Martian dust devils exhibit electrical characteristics. There are also electric whirlwinds on Earth. As long ago as March 2005, Electric Universe advocates wrote about the surprising discovery of dust devils spinning across the Martian deserts. Cameras in space, as well as on the Martian surface returned many images of large, glowing funnels raking across the flatlands, leaving darkened trackways behind. Since the atmospheric density on Mars is so low (less that one percent that of Earth), how can a strong “wind” carve the soil and leave multiple tracks that can be seen from space? What energizes global dust storms (that are really a combination of mountain-high dust devils) in such a rarified vapor of frigid carbon dioxide gas? The conventional theory of dust devil formation on Earth describes a vortex of warm air that begins as a horizontal “rotator” near the ground. 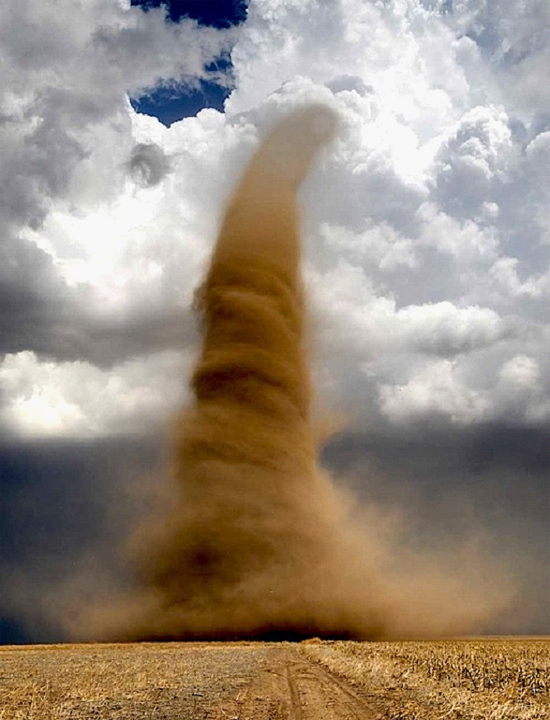 As the spinning air gains momentum, it “stands up” vertically, forming a cylindrical cloud of dust that twists its way over the surface, gathering more debris as it goes. As it increases in strength, it tightens its diameter like an ice skater doing a pirouette. As it contracts, the dust storm spins faster and faster. However, on Mars there is no vortex of spinning air to move into a vertical orientation and form the dust devil. Yet, there are funnels that climb thousands of meters into the sky on Mars and engulf nearly a whole hemisphere with their burden of sand and other small particles during certain parts of the year. A better explanation for dust devil formation on Earth, as well as Mars, could include electric fields. Most atmospheric scientists claim that “saltation” is generating the electric fields that they found years ago in the dust devils of Arizona. Saltation means the intermittent, leaping movement of sand and gravel particles from the force of wind or running water. In other words, the sand particles are believed to be generating electrical charges close to 10,000 volts per meter by rubbing against each other. In several previous Picture of the Day articles, it was pointed out that it is not necessary to postulate strictly mechanical activity for the electric charges that have been found in dust devils. To get the electric field, conventional researchers believe, there has to be charge separation from the collision of sand and soil particles. It is those collisions, they say, that causes the larger particles to become positively charged and the smaller ones to become negatively charged. The wind then disperses them into regions of sorted sizes, creating an electric field. In an Electric Universe, no collisions from bouncing sand grains are necessary. Charge separation already exists in the atmosphere. Without clouds like those on Earth to send lightning down to ground level, the electric discharges on Mars form giant whirlwinds that are part of an interplanetary electric circuit. It is the kind of circuit that drives weather systems on Earth. If this is true, then Martian “dust devils” and those on Earth are both illustrations of how electricity behaves in the solar system.